I decided to dye some roving in mixed colours. 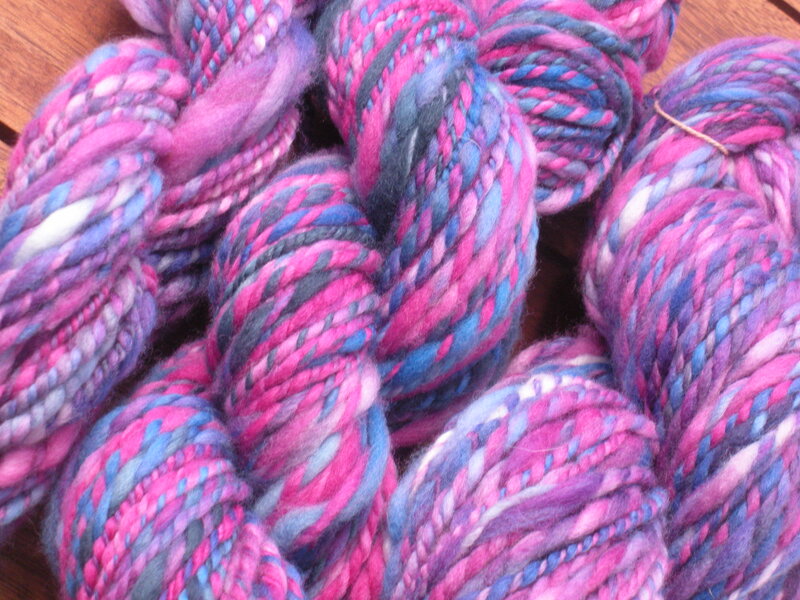 So, I braided my merino roving, soaked it overnight, spun it dry in my washing machine until it was moist but not wet (I have to say I won’t do this again–it compacted the fibre a good deal more than I expected), and got out my Earth Palette dyes. These dyes are made by a small business in a country town called Gladstone, in my state. I’m pleased to see they’ve made it onto the interwebs. The railway between Adelaide and Port Augusta used to stop in Gladstone and I had a holiday there once. It’s not much of a tourist destination, but I was there for the fine company. I had pre-mixed several colours and that is what you can see in the soft drink bottles. 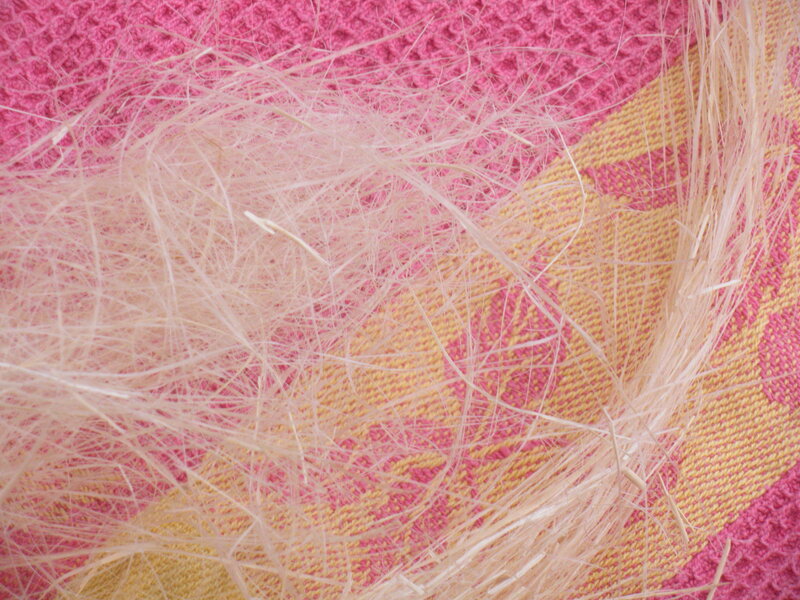 These dyes can be applied cold and fixed at room temperature–what a fantastic system. So I applied dye, plastic bagged each plait, and set them in a warm sunny spot to fix. 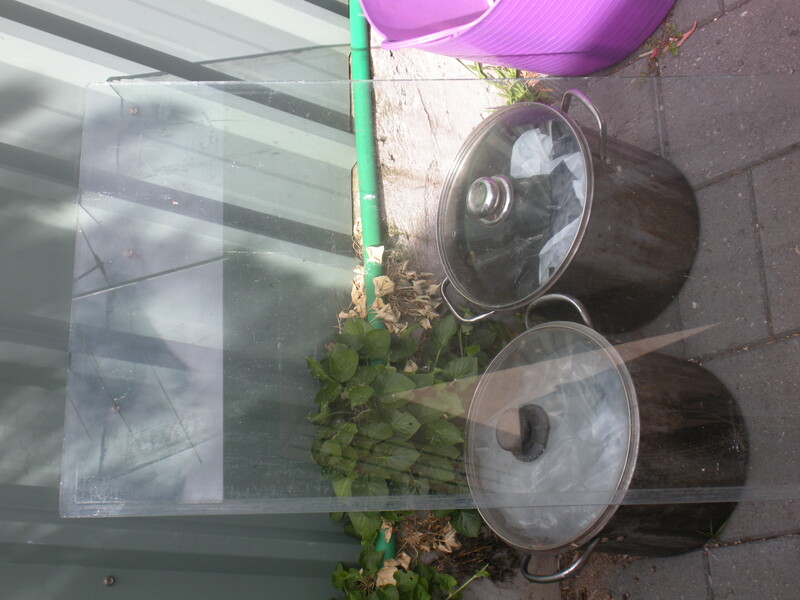 I enhanced the warmth factor by putting the plastic bags in my dye pots and under a pane of glass since we’re expecting 20C maximums. Ahhh, what a simple method. I was really happy with the colours… but it turned out that as I feared, spin drying this merino roving, even though it was braided and bagged and cold and I’ve done this before without trouble… meant these braids needed to find adifferent use than the one I had planned. They will never draft easily or evenly. So I’ve been spinning them up after extensively fluffing them up. 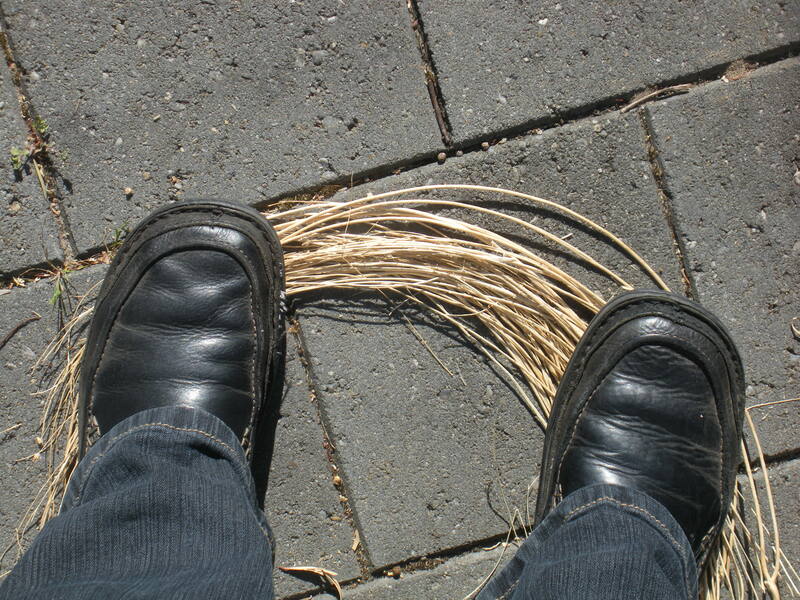 Once again…not exactly what I planned, but sufficiently satisfying. 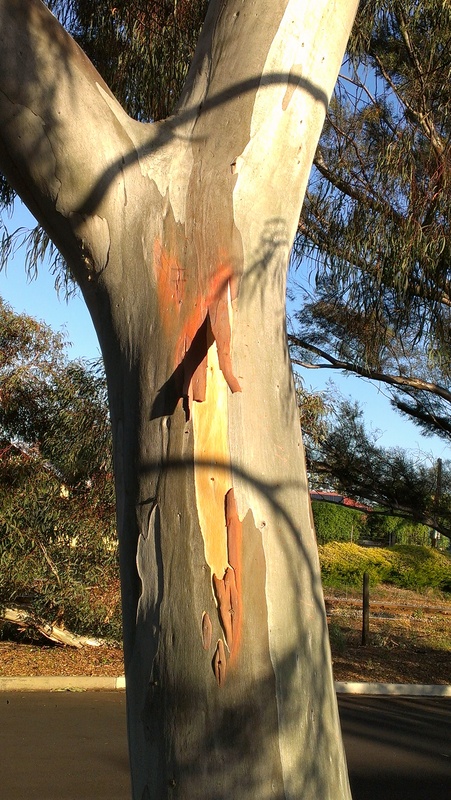 Finally today a friend from my Guild has been able to tell me the name of some of my favourite dye Eucalypts. 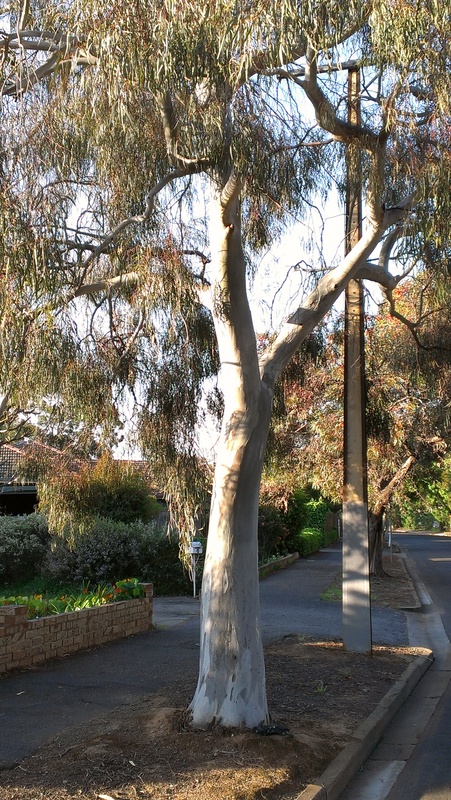 Here is one example: Eucalyptus Scoparia (Wallangarra White Gum). 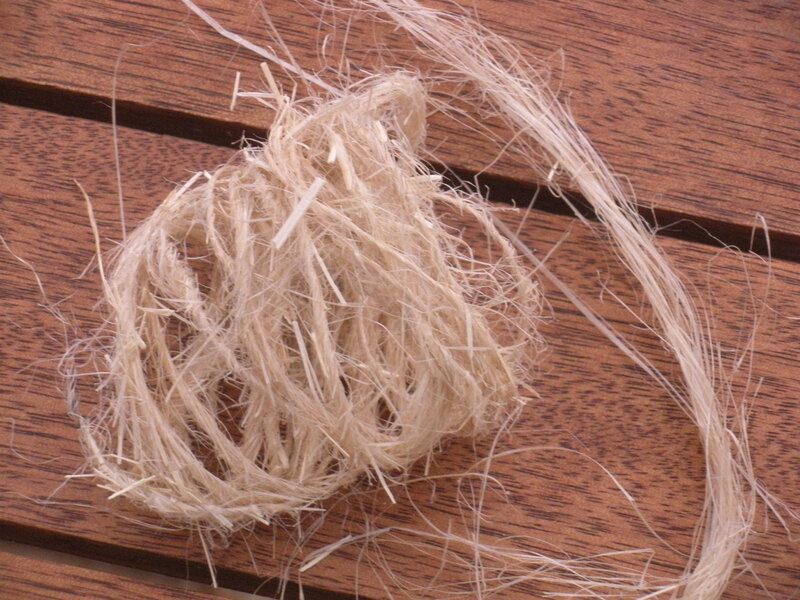 And this is a corespun yarn. I carded merino dyed with E Scoparia bark with dyed mohair locks and dyed silk and corespun it over a crossbred wool core. Thanks to E Scoparia, and thanks to Helen for organising an identification for me! At the end of a lot of hand picking and an experiment with hand cards, with more chaff spreading around the place at every stage… I was left with this: some longer fibres and some tow, still with quite a bit of chaff attached. I decided to try spinning despite this falling quite a way short of optimal preparation. Yes, this is the total amount of fibre! 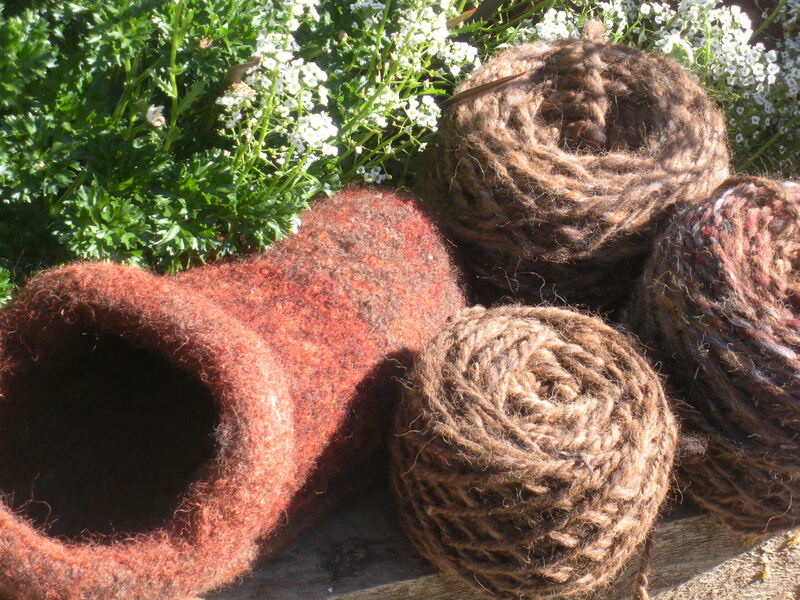 Yes, I have spun flax before (and it looks like yarn–do I sound defensive?). And yes, when I found that last bit of fibre hiding in one of the many teatowels used in the process after I had taken the flax off the bobbin, I was annoyed. 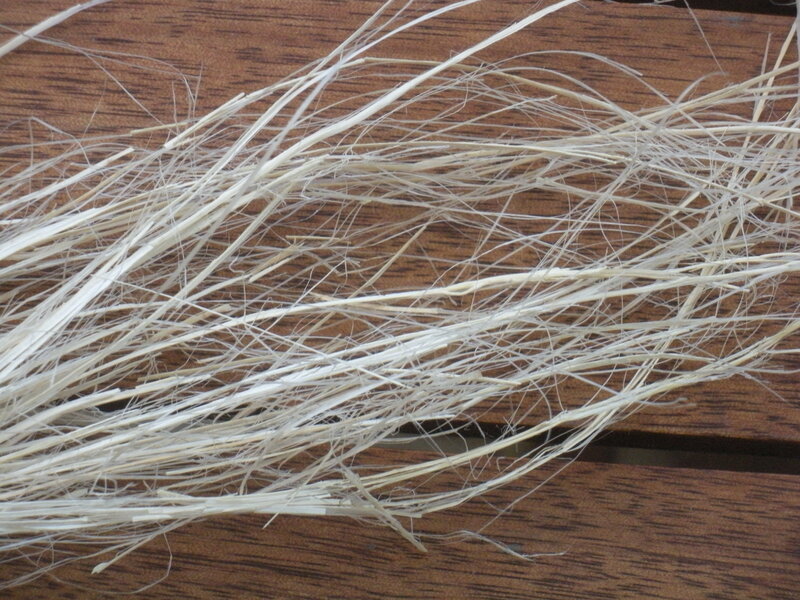 I have been fascinated with the idea of growing fibre for spinning for a long time, but it is not a simple matter to process bast (stem) fibres. There are amazing YouTube videos of people (in Nepal, for example) spinning fibres which must have been hand prepared with the most basic of equipment and a corresponding maximum amount of skill, time and patience. There are also videos showing the process of linen production from start to finish, like this Irish film. Here is a re-enactment film using decent tools but with all steps done by hand (needless to say I lack the right tools and must improvise), and another showing how this was done in Germany (with an excellent rooster crowing in the backgound). Even with some parts of the process mechanised, the preparation of the fibres is backbreaking and dangerous work I’m glad I don’t depend on doing for my living. The skills and tools needed for hand preparation of bast fibres were probably known to someone in my family tree, but at a guess, this must have been many generations back. I’ve decided to have another attempt. I have here the total outcome of my latest nettle harvest (left) and my first flax harvest (right), dried and saved. No, it isn’t impressive! 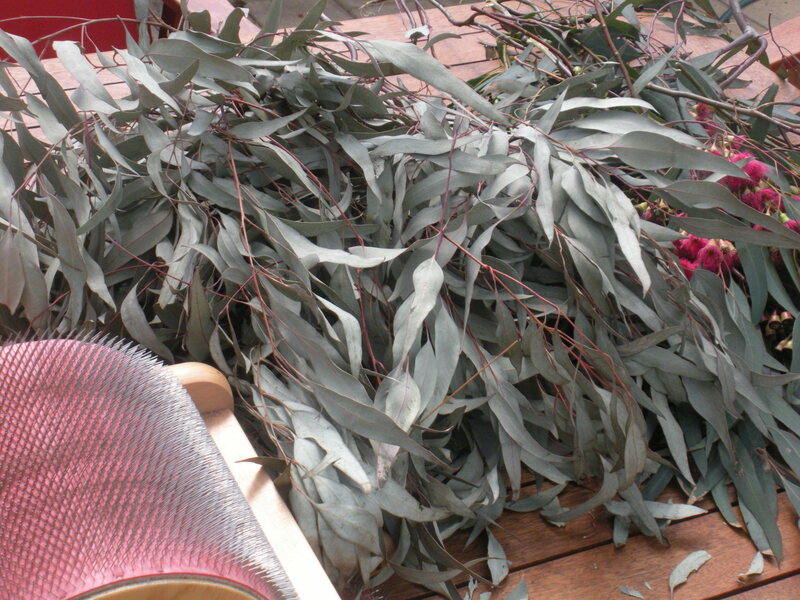 I have pulled them, stripped the leaves and side stems and dried them. Next step, retting. I put the stems into a bucket and covered them with rainwater on Labour Day. It’s important to celebrate the achievementof the 8 hour day by doing things you love, so I was washing fibre and mucking around in the garden, visiting friends for dinner and making treats for the week to come. And, putting these stems to soak. The week turned out to be warm, so I changed the water several times. Part way through the week, Through the Eye of a Needle by John-Paul Flintoff arrived in the mail from dear friends in Denmark. They know me well! I have already read this book and just loved it. In fact, I set about this experiment after a long break from thinking about it because I followed a link to a YouTube video of Flintoff talking about nettle fibre. Needless to say it falls short of being a full instructional guide on how to rett nettle fibre. 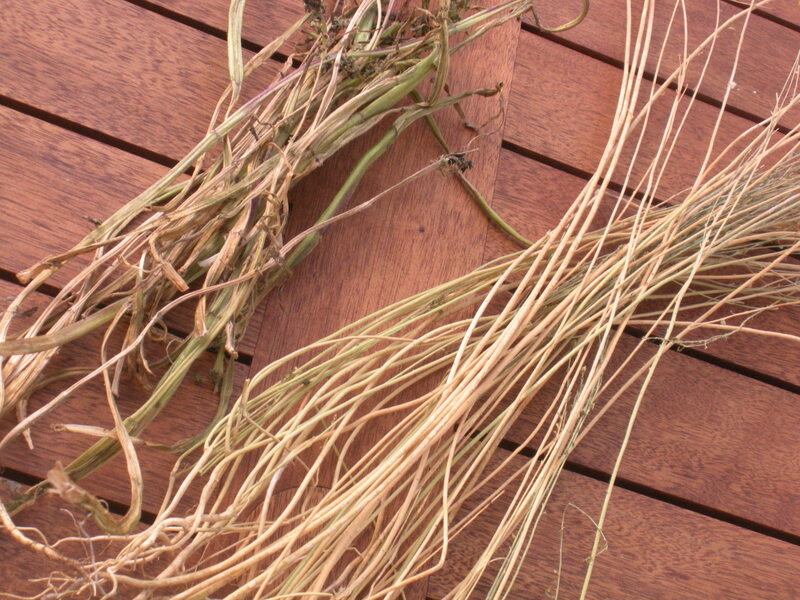 In fact, I have really struggled to find any instruction on how to decide when flax or nettle has retted long enough. Even Alden Amos’ Big Book of Handspinning (not normally a model of concision or falling short on the challenge of offering instructions) offers no real assistance. I am guessing that even a skilled person might struggle to describe how much decomposition of the woody parts of a stem is enough, but not too much! The most detailed account I’ve found is online here. So, I decided to leave the stems in the water for 5 days–based on the best advice I could find so far. 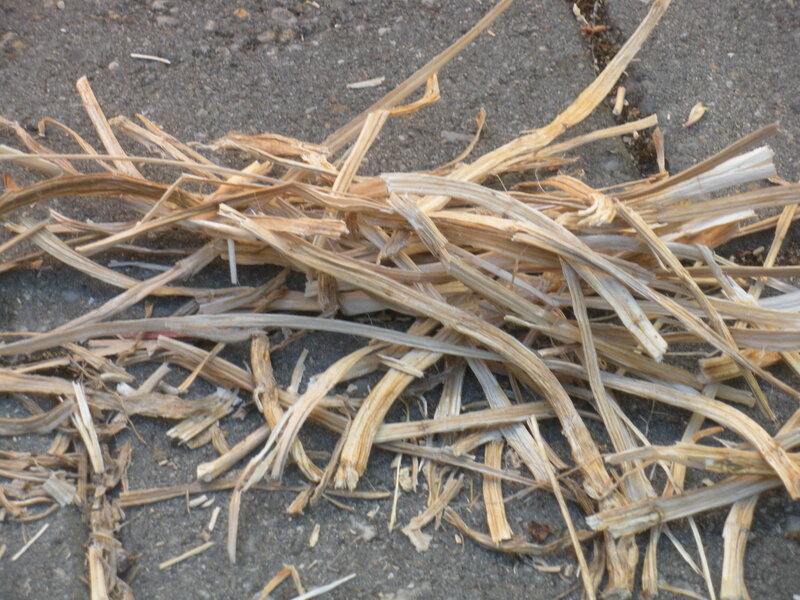 At this stage I delared the nettle unfit for further effort (shattered into pieces with little evidence of fibre). I am not sure why. I squashed the nettle stems as they were drying out the first time and maybe that was wrong, or maybe they were just too young. 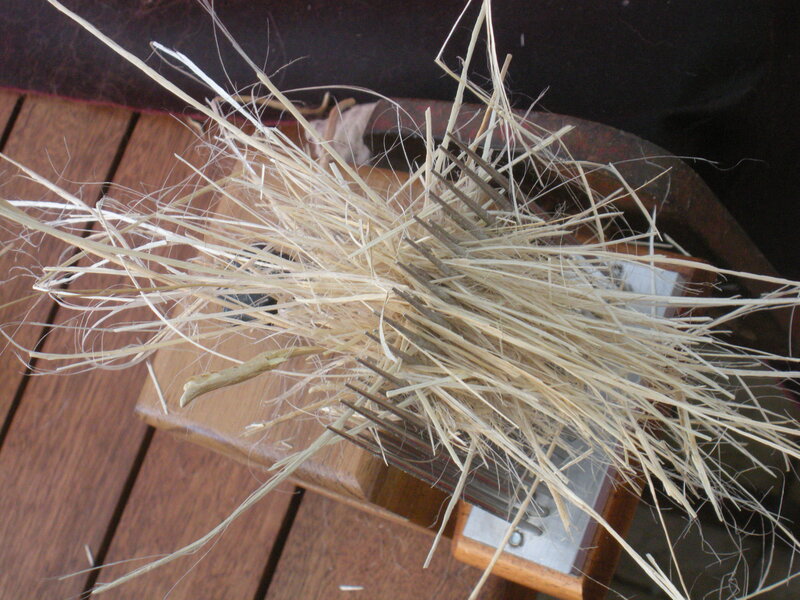 Fibres were becoming more visible at each stage of flax bashing… and more chaff was falling away. I would say that means it was retted long enough. I tried my wool combs. Not great for the job, but some improvement. 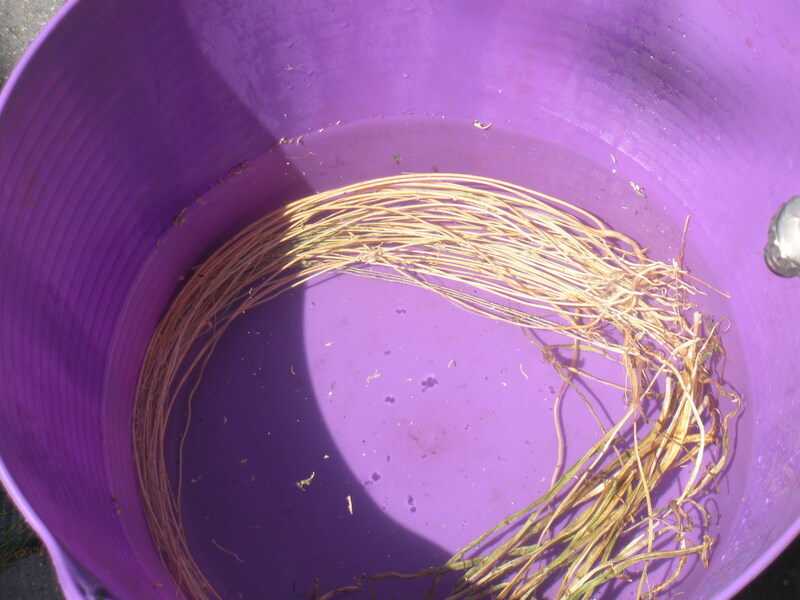 I really don’t have the tools (let alone skills) for breaking, scutching and hackling, and looking at the videos in the links above suggests my flax is very poor quality and short–no great suprises there either! Next stage, laborious hand picking, I think. Turning a sow’s ear into a silk purse. I mean, a slipper. This week’s question is whether I can turn a sow’s ear into a silk purse slipper. I have been the lucky recipient of a lot of free fleece since I took up spinning. It all started with some filthy Gotland fleece straight from the sheep’s back that my Dad gave me. He had provided the antique engine that was running the shearing plant in a demonstration of hand shearing at a local show. Because he knew I wanted to learn to spin, he brought home a few handfuls. He is a great enabler! 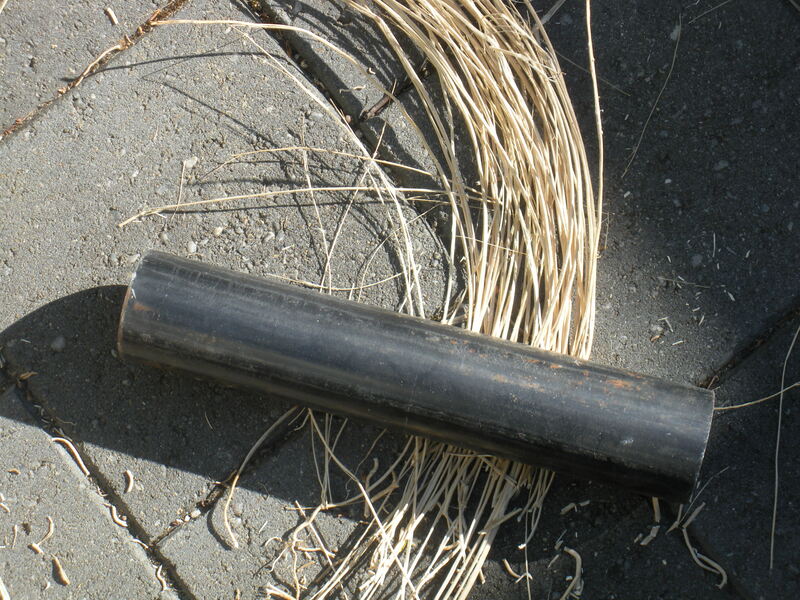 It was rough and filthy, but I spun it on my first spindle and was grateful. Admittedly, Dad said there was a handspinner at the show and he had spoken to her about it: she advised doing me a favour and not bringing that fleece home to me, but naturally, he didn’t listen! And I was glad. I didn’t know anywhere I could get fleece then. 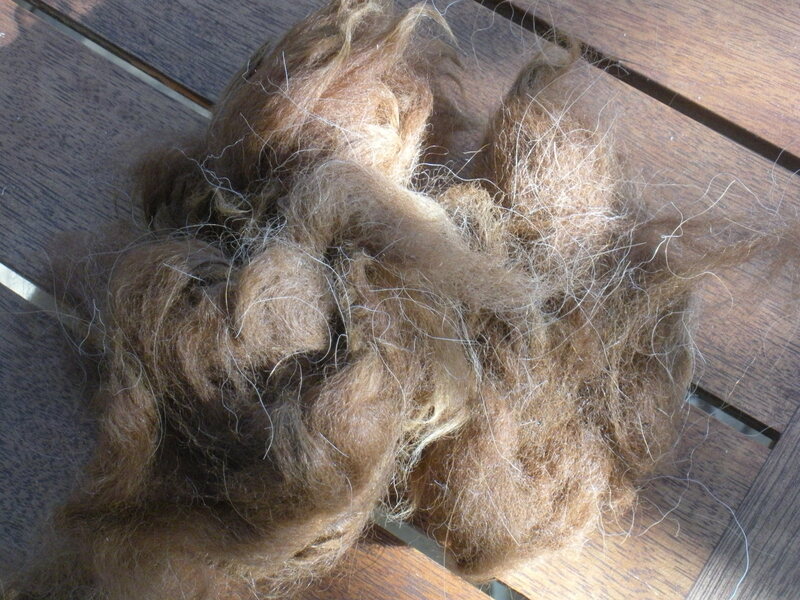 Next, I was given several bags of Dorper fleece by friends who were keeping Dorpers as meat sheep. I didn’t understand the meaning of ‘meat sheep’ in the context of fleece at that stage. Dorpers shed their fleece rather than needing to be shorn when they are pure bred, which might have been a clue to (lack of) spinnability for a more knowledgeable person, too! 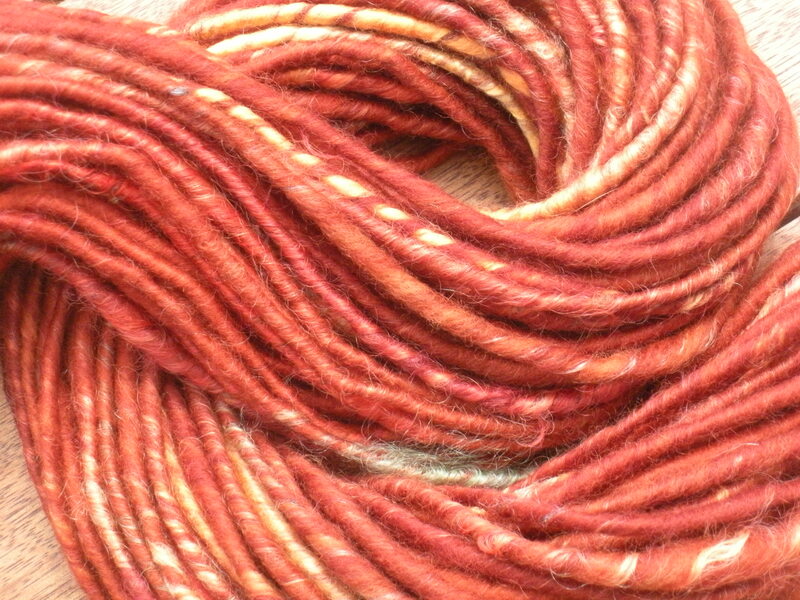 I dyed it, I spun it, I carded it… oh my goodness. 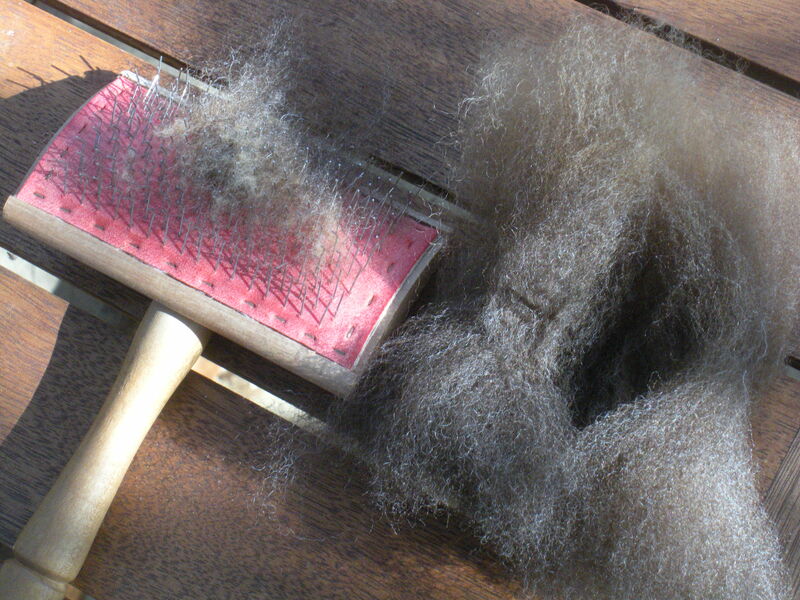 It was the beginning of my fleece preparation journey and it was a very challenging start. Months later the woman who had lent me her carder said when she saw what I was working with, she was just overcome to think I would even try to spin that fleece! She didn’t offer me her opinion at the time, though, and it was a long time before I decided that I could, perhaps, compost the rest as my struggles were not only about my lack of skill but also about the state of the fleece. Needless to say I have also received fleece that has spent lengthy periods in a shed and bred an overwhelming moth population. Happily, I had said fleece in a plastic tub with a lid. So… I have had some personal experience of the possibility that people who give the gift of fleece don’t have the judgment necessary to decide whether what they have handed over is worth spinning. I have to be the one to decide whether the fact that I could turn that into yarn given enough time and effort, is a sufficient reason to do it. 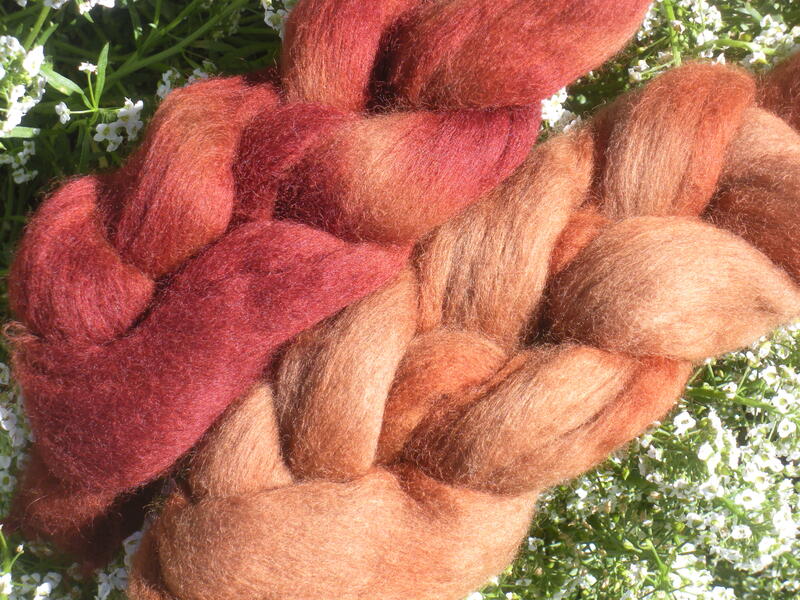 I think I have proved to myself that I can spin almost anything–if I could spin those fleeces as a beginner! 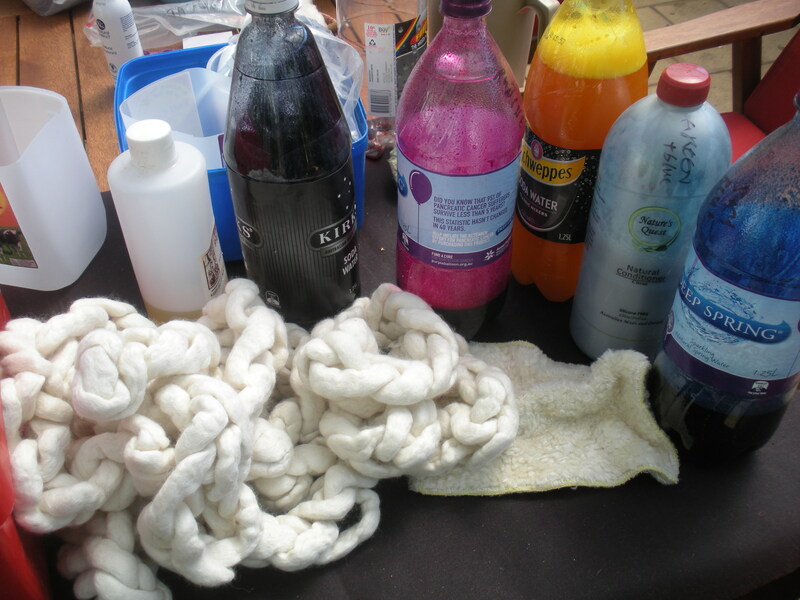 I went to a couple of workshops on fibre preparation (washing, combing and using hackles) at the recent Majacraft Magic camp at Lake Dewar outside Melbourne, and came home ready to tackle some of my current fibre preparation challenges. I had reached some new conclusions about why I find getting fleece clean difficult sometimes. 1. our hot water tap doesn’t give very hot water, and can’t be adjusted. Boiling the kettle repeatedly is boring, as well as slow, after a while! 2. I can be more slapdash than is ideal for the task. 3. Most of the fleece I currently have is Polwarth, more gifts from a couple of pet sheep in the hills. 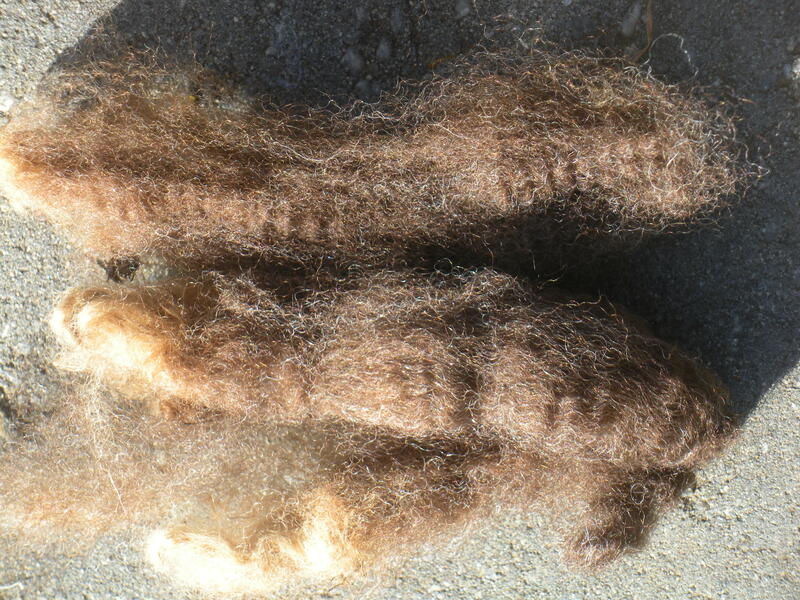 This is a fine and greasy fleece, among the more challenging to clean. 4. I always hope to be able to wash a bigger batch of fleece than is desirable for optimal results. 2. That same fleece has a break in it, so the longer locks are giving way under the tension involved in carding, again leading to less than optimal batts. 3. The alpaca is super short (happily, I have now worked with high quality alpaca and no longer assume this s just the way alpaca comes). It has not really been skirted. Most of it pulls onto the licker-in (the small drum on the drum carder) when carded. Yes, from the very start, and not only when the large drum is full. 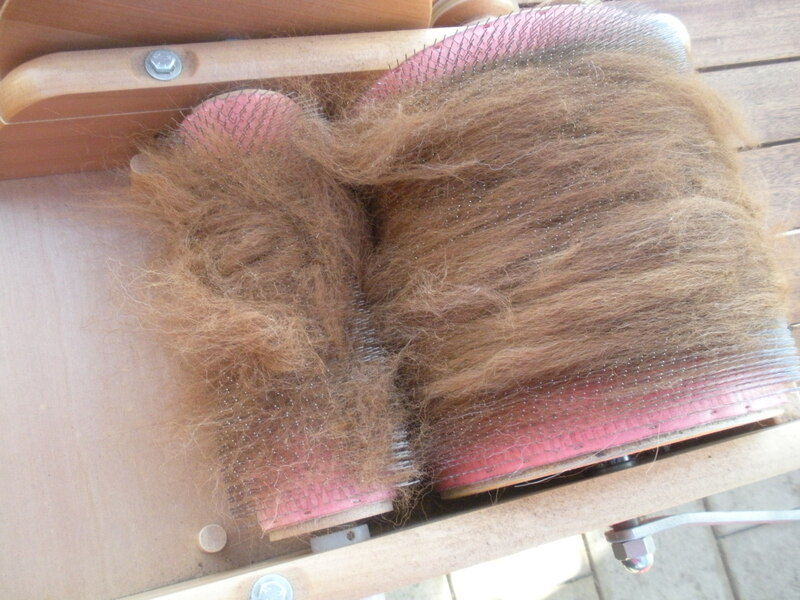 4.That alpaca has big clumps of guard hair and has been shorn without consideration to the future spinner. Hopefully the shearer was thinking of the animal’s welfare in taking so many passes! In short, these are not the highest quality fleeces possible and they would present challenges to anyone preparing them for spinning. No matter how much time I spend I may not be able to turn these sow’s ears into the proverbial silk purses. I have decided, instead, to attempt to turn them into felted slippers. I am carding them together as a blend, spinning them up without too much fuss and very fat (good practice) and my ultimate plan is to knit slippers which will be felted and perhaps dyed. Shazam! Their less than ideal qualities will no longer be of importance. I hope! I went into the city to hear a presentation the other week, and on the way back there were so many opportunities to harvest that I couldn’t help but pull my bike over and pick some E Sideroxylon (Red Ironbark) leaves. Yes, I did get a few looks… but I am reasonably impervious! And here are some of the flowers. 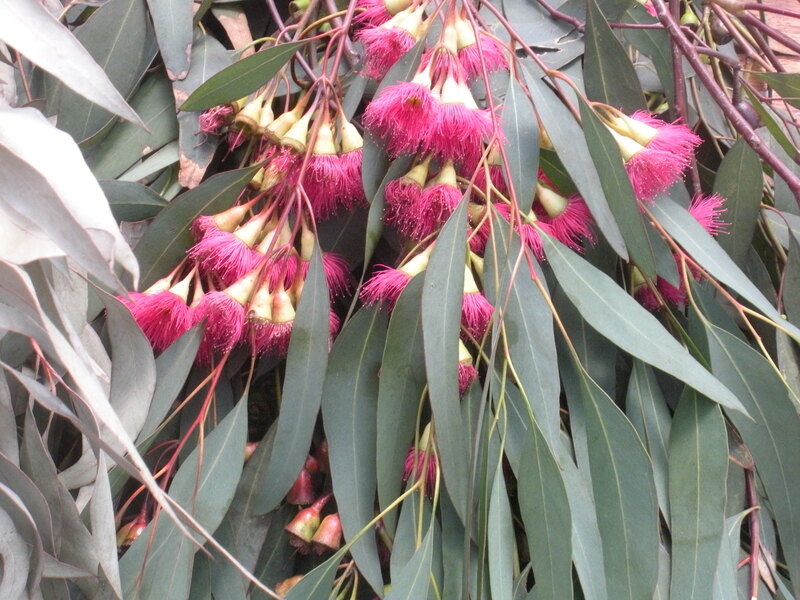 There is one of these trees in full bloom next door to my house and there are lorikeets and honeyeaters feasting on these flowers in next door’s back yard calling to each other all day long at the moment. I love it. 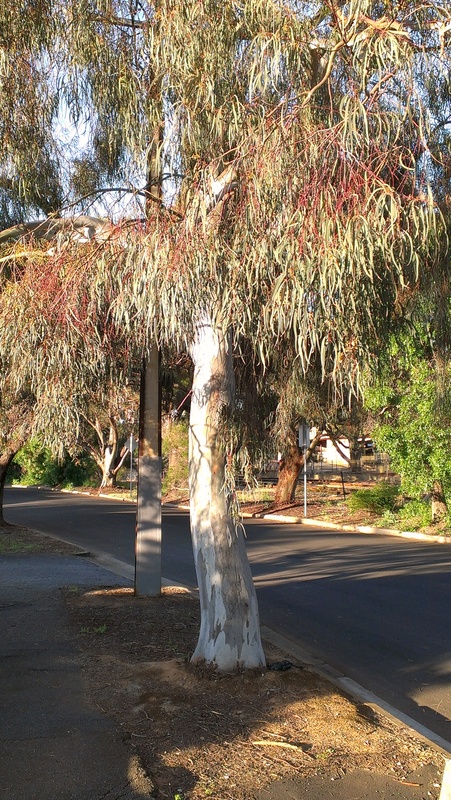 This is another of my favourite dye plants, and another Eucalypt that is as-yet-identified. It has very fine leaves and a lovely weeping habit. 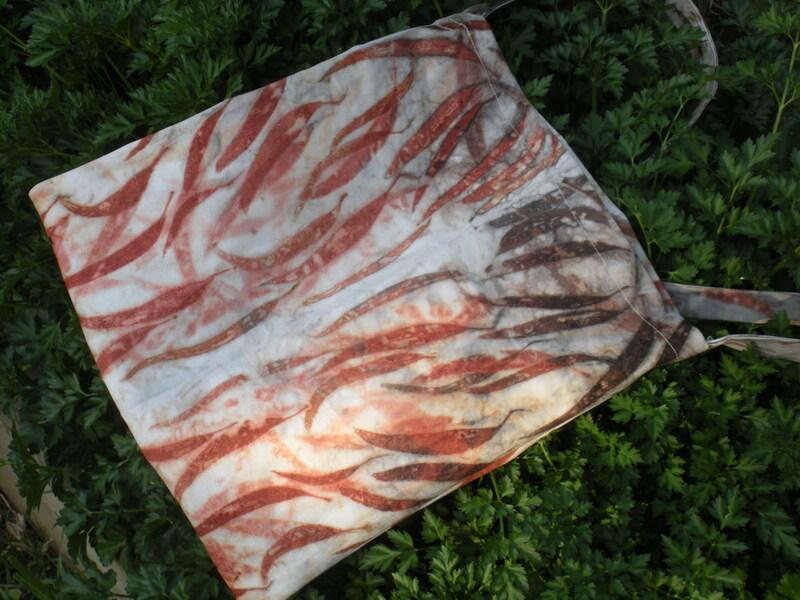 I’ve used it to create tablecloths with leaf prints cascading across them. For much of the year the trunk is white to grey, and then as it enters the period of the year when it sheds its bark, pinks and reds begin to appear. It looks like I’ll be visiting again soon to collect bark. When I visited today there were several generations of fruit as well as white flowers on the tree. I had a very funny visit to this tree last year. I pulled over on my bike and was harvesting when people pulled up in the driveway next to it. I greeted them, since there was no way to pretend this wasn’t happening. They were glad I was trimming the tree and explained that they thought the council should be pruning it more diligently. I offered to come back and prevent it hanging over the footpath and they were enthusiastic, so I came back with a friend, secateurs, a chook food sack and a milk crate a few days later. Very funny! There was I being selective and taking little… until we went back and took a sackful of leaves, which have lasted through the winter.